For many months, Glenn Beck has promoted The 912 Project, which along with other groups, including FreedomWorks, have coordinated a grassroots movement culminating in a March on Washington, D.C., this past Saturday. Smaller 9/12 tea parties took place around the country at the same time. I couldn’t attend because my young daughter had surgery on Friday. Thank you everyone for your thoughts and prayers. She came through it fabulously and is on the road to recovery. Saturday, I sat glued to the TV watching the coverage of the DC rally. Wow is the word that comes to mind. I wish I could have been there. Crowd estimates range widely from “tens of thousands” by the television networks, 1.2 million by the Metro police and 1.5 million by Parks and Recreation. View the time lapse DC traffic camera and collections of 9/12 Rally pictures and judge for yourself which is the most accurate. Over the weekend I spoke to many friends about what we saw on TV and the internet about these rallies. In our lifetime, average people have never come together in this way in support of our country and our founding principles. These people were not moved to take to the streets because a political party, a political figure, or someone “told” them to do so. They came out en masse because they honestly feel our country is moving away from the ideals, principles, and freedom that makes our country so unique. I fully believe that our Founding Fathers would be proud to see us exercising the rights given to us by our Creator and guaranteed in our Constitution. It is an inspiration to watch people wake up and come together to stand up for their beliefs in our ideals, principles and Constitution. I wish I too could have been there. But I wonder if I would have missed all the great games, including UH. 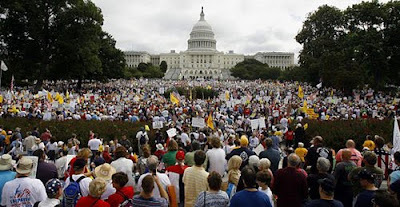 I also saw pictures of the post-912 rally and the post-Obama-inauguration. Conservatives were kinder to the environment this past weekend. I am a registered indepedent, and I have never listened to Glenn Beck (although I read plenty of excerpts of him and others). I am glad to see conservatives protest for a change. And I am sick of the mainstream media feeding us falsehoods. These "journalists" are an embarassment to their profession. The Left's outrage at the idea that the opposing side would dare exercise 1st amendment rights is laughable. As if they own the copyright to protesting the White House! And according to MSM I am an angry white man. How funny is that? !